Woodcuts have a long history in China dating at least from the Tang Dynasty (See Note1)(618-907 BCE), and for centuries they have contributed greatly to Chinese print and folk cultures. In the 20th century, woodcuts as an artistic medium underwent a dramatic renaissance that introduced expressionistic and realist techniques into traditional Chinese folk traditions in order to communicate stark messages about China’s social and political states of affairs in an attempt to forge a new nationalistic identity throughout China. Modern Chinese woodcuts provide a dramatic record to chart the 20th century revolutionary causes that profoundly changed Chinese society and culture. The modern woodcut movement of the 1930s introduced an avant-garde expressionism of early revolutionary zeal, whereas woodcuts of the mid-20th century would eventually return to more traditional Chinese folk aesthetics in order for the Communist Party to use woodcut prints as an effective propaganda tool to reach masses of illiterate citizens throughout the countryside. The legacy of both the critical realist tradition of the early avant-garde period and the Socialist Realist (See Note2) folk tradition of the mid-20th century continue to inform new and innovative expressions of woodcut art in the late 20th and early 21st century, which have returned to pursuing an avant-garde critical aesthetic that grapples with a very different China – one that has undergone profound reforms rather than revolutions, and a country with a renewed sense of cultural pride. What is the tradition of woodcut art in China and what other traditions inspired the Modern Chinese Woodcut Movement? What were the social and political contexts that stimulated so many changes in woodcut aesthetics in the 20th century, and why was woodcut art so appealing to the artists as a medium to respond to the social and political issues of this time? How can we read a modern woodcut to learn more about modern Chinese society and about the culture of the woodcut artists and audiences alike? These resource materials are available on China Institute’s dedicated website for teachers and students, www.China360online.org. We hope these resources serve as a springboard for further study of this fascinating time period and how each woodblock print has the uncanny ability to speak both for its historical moment while also transcending its specific time and place to tap into an enduring aesthetic tradition that continues to evolve and speaks to all of us. 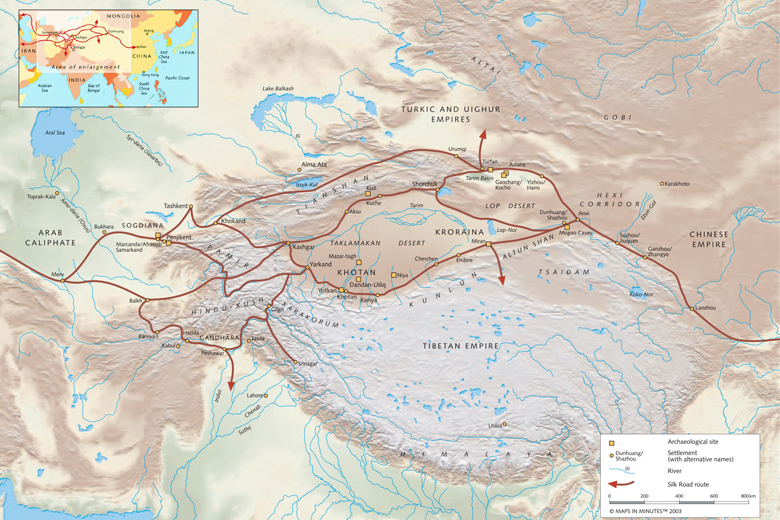 Tang Dynasty – (618-906 CE) a dynasty often regarded as a high point in Chinese civilization, marked by a cosmopolitanism that attracted trade with peoples from all over the Asian continent and a high achievement in art and cultural production. The Tang marked the full fruition and the end of China's early imperial age. Socialist Realism – an aesthetic style of art and literature that glorifies the role of peasants, workers, and soldiers in realizing communist and socialist ideas in society. The woodcuts featured in the exhibition, Woodcuts in Modern China 1937-2008: Towards a Universal Pictorial Language, represent a fascinating period in the 1500-year history of woodcuts in China, which have been used for Buddhist sutras, book illustrations, folk décor, propaganda, or fine art depending on time, place, and/or need. Due to their widespread and varied use, therefore, woodcuts are an invaluable resource for learning about many aspects of Chinese culture. This section examines the effect of China’s geography on this rich cultural art form, and how human culture in China, through art, reacts to geographic conditions. Three topics in particular provide a fruitful approach to these issues: local and regional diversity in China, disparities between urban and rural demographics, and the effects of economic development on rural populations. For the purposes of understanding the development of woodcut art in the 20th century and its relationship to historical events in China, we can break the 20th century into three distinct periods: Republican China, Revolutionary Socialist China, and Reformist post-Mao China. Considered the founder and one of the most brilliant writers of modern Chinese literature, Lu Xun’s short story Diary of a Madman (Kuángrén Rìjì 狂人日记) set the precedent for the accepted use of the vernacular (báihuà 白话) in Chinese literature. Lu Xun was born in 1881 to an educated family in Zhejiang province, but a bribery scandal involving his grandfather, combined with his father’s prolonged illness from tuberculosis, meant that Lu Xun’s childhood was beset with hardship and financial difficulty. Spurred by his father’s illness and eventual death and harboring a particular mistrust of the traditional Chinese medicines that could not save him, Lu Xun went abroad to study medicine in Japan in 1904. It was in Japan that Lu Xun had his political awakening. He was appalled by an image from the Russo-Japanese War, in which apathetic Chinese onlookers watched as their compatriot was executed for allegedly spying against the Japanese. Lu Xun decided that what his countrymen needed most was a cure not for whatever physical illnesses they might have but for their spiritual malaise. He dropped out of medical school and began to write and translate, focusing on the Confucian family structure and other aspects of traditional Chinese society he believed to be detrimental. Through his work organizing artists and writers, as well as founding a number of publications, Lu Xun became interested in woodcuts as an inexpensive and vernacular form of art that could carry critical cultural and political messages in visual form. He was heavily influenced by German and Japanese artists and organized exhibitions of their works in China. In 1931 Lu Xun organized a group of students and artists for a printmaking workshop held by the Japanese artist Uchiyama Kayoshi, kicking off the beginning of the modern woodcut movement in China. Lu Xun believed that while it was important to learn from foreign woodblock print styles, Chinese artists should seek to create works that spoke to the Chinese condition and were informed by traditional Chinese printmaking styles as well. This gave birth to the stark black and white images of early Chinese woodcuts, which sought to highlight societal wrongs and incite a call to protest. Lu Xun died in 1936 and did not live to see the founding of the People’s Republic of China. The Lu Xun Academy of the Arts was founded in his honor in 1938 with a mission to train and nurture the talents of young artists, particularly in support of creating art for political propaganda. The Lu Xun Academy was the site of the Yan’an talks in 1942 (see History), in which Mao declared that the purpose of art was primarily to promote a political agenda, and later woodcuts took on a more social realist style. Lu Xun’s patronage of 20th century woodcut art is evident in such works as Song Guangxun’s Brave Chinese Women (Portrait of Lu Xun), created in 1974. When the revered writer and social critic, Lǔ Xùn (鲁迅) (see Culture & People), pushed for a new form of Chinese woodcuts in the 1930’s, he strove for nothing less than social revolution by repositioning an ancient Chinese art form with a modern European style. By doing so, he separated woodcuts from their traditional antecedents, art forms like niánhuà (年画), the lively folk art usually attributed to the lunar new year. While the modern woodcuts that arose from Lu Xun’s efforts — such as those by artists like Lǐ Huà (李桦) and Hú Yīchuān (胡一川) — employ bleak contrasts of black and white and unsettling, sometimes violent, imagery to communicate social issues, nianhua are vibrant, colorful and unfailingly positive. Often translated somewhat misleadingly as ‘New Year Prints,’ (they are left up year-round and are sold during other festivals, such as the qīngmíng (清明) festival) nianhua have brightened Chinese homes since they became commercially available on a wide scale during the Táng (唐) dynasty (618-907). Woodblock printing was first used in China between the third and the ninth centuries. In 1907, the British explorer Aurel Stein, working under still controversial circumstances, discovered the earliest datable example of woodblock printing, buried and forgotten for eight centuries in the Mogao grottos (mògāokū 莫高窟) outside Dūnhuáng (敦煌). Dated to 868 CE, The Diamond Sutra was printed on paper from exceptionally well crafted wooden blocks that suggest a back story of artistic development that archaeology has yet to recover. By the Míng (明) (1368 – 1644) and the Qīng (清) (1644 – 1911) dynasties, woodblock printing was used prolifically for a variety of illustrations and printings; but it was the mass popularity across China of nianhua as a visual medium that made this art form appealing to people such as Lu Xun, who wanted to educate a huge but largely illiterate population. In the Chinese tradition, nianhua serve different functions in homes and businesses depending on the consumers, but their decorative appeal and connections with fate and good fortune are fundamental qualities. According to Chinese folk beliefs, certain nianhua foster the blessings and protection of powerful spirits and gods, and the imagery of nianhua is believed to evoke very specific connections with the user’s fate. A family of merchants, for example, might purchase a colorful depiction of teeming coffers of wealth, whereas the family of a young scholar studying for the civil service examinations might prefer an image depicting examination success. Sometimes, these images are chosen to capitalize on Chinese homonyms — a Chinese form of rebus. A colorful image of a monkey may therefore be symbolizing promotion to a higher office, as the word for ‘monkey’ and ‘high office’ are pronounced the same (hóu), differing only in written form (猴vs.侯). Alternatively, some nianhua are used for protection. Ferociously depicted door gods (ménshén 门神)are positioned at front and back entrances of buildings to block evil spirits from entering and harming the occupants. Originating in Chinese mythology, door gods from the Tang dynasty on often feature historical characters. According to a legend, the Tang emperor Taìzōng (太宗) posted images of his most revered generals, the legendary Qìn Qióng (秦琼) and Yùchí Gōng (尉迟恭), outside his door as protection. As prints became more readily available with the development of woodblock printing technology, ordinary Chinese people began following this tradition, believing Qin Qiong and Yuchi Gong could safeguard their own locales. Another popular door god and protector is the fierce mythological figure, Zhōng Kuí (钟馗), who also features in Japanese art. It is said Zhong Kui visited the Emperor Xuánzōng (玄宗) in a dream to battle an evil spirit and protect the emperor, who then swore by Zhong Kui’s power. Usually depicted as a solitary figure, Zhong Kui is often posted on single doors while larger, double doors are usually flanked by pairs like Qin Qiong and Yuchi Gong. Due to their high importance in China, cultural rituals have developed around some nianhua, specifically with regard to the prints of stove gods (sometimes translated as kitchen gods) that are hung in kitchens and feature lunar calendars together with colorful imagery. According to tradition, the stove god and his wife would watch over the family and take notes of everything that is said in the household before filing a report to the king of heaven, the Jade Emperor, at the end of the lunar year. These nianhua would be ritualistically burned on the twenty-third day of the twelfth lunar month to send off the stove god to heaven. Sometimes people would spread honey on his lips to sweeten his words (or perhaps to seal his lips) before he is sent on his journey. A week later, a new image, together with its accompanying calendar, would be posted on the kitchen wall to welcome the stove god’s new year blessings. The imagery of nianhua and the folktales behind them can differ significantly depending on where in China the prints are produced and used (see Geography). The relatively simple and inexpensive technology behind their production gave rise to a ubiquitous material culture that offered the ideal medium for the modern woodcuts of the 1930’s. Influenced by the works of contemporary European expressionist woodcut artists such as Käthe Kollwitz and Frans Masereel, who championed social issues with their evocative prints, Lu Xun promoted this new art form using an established Chinese medium but incorporating stylistic elements of the European woodcuts. Eventually, however, some artists noticed that the intended audience of these woodcuts, the ordinary Chinese citizens, found the style of these new woodcuts too unfamiliar and alienating. Gu Yuan’s print, Marriage Registration, demonstrates a return to traditional Chinese styles that mark the beginning of the socialist period, announced by Mao Zedong in his influential “Talks at the Yan’an Conference on Literature and the Arts,” which set the aesthetic standard for years after (see Appreciation). One way to understand how woodblock prints have been appreciated during the 20th century in China is to consider the subtitle of China Institute’s Fall 2010 exhibition, Woodcuts in Modern China 1937-2008: Towards a Universal Pictorial Language—by aspiring to move “towards a universal pictorial language,” what were the artists trying to articulate in their images that ostensibly speaks to everyone? In other words, what is universal about these woodblock prints? And how is the medium of woodblock print related to the universal aspiration of speaking in a pictorial language immediately understood by all? By putting the modern Chinese woodcut movement of the 1930s and early 40s in relation to other progressive international print-revival movements that took place throughout the world in the early part of the 20th century, we can begin to explore this idea of universality. The images created in China in the 1930s and 1940s are roughly contemporaneous happening in Europe, Japan, and the Americas, and thus these Chinese woodcuts are staking a claim to the title of “modern”; the stark black-and-white woodcuts depicting human deprivation and an urgent need for popular resistance are radically different from traditional woodblock print culture in pre-20th century China (such as traditional nianhua prints—see Material Culture section) and share much more in common with the suffering peasants and workers depicted by such renowned European modern woodcut artists like the German Käthe Kollwitz and the Belgian Frans Masereel. Li Hua’s 1936 print China, Roar! is one of the most iconic images from the modern woodcut movement in China. The allegorical everyman depicted naked, bound, and blindfolded in the print can only scream out in rage at his seemingly hopeless situation (although he seems just on the verge of grabbing a nearby knife which almost glistens with hope in the bottom corner) and the title clearly intends for the viewer to associate this one man’s fate with the fate of the nation. Putting this image in relation to one of the most recognizable classics of European Expressionism, Edvard Munch’s The Scream (1895), once can see that while the two prints were created at different historical moments in very different cultural settings, the two images nonetheless clearly share a common pictorial language that transcends their specific cultural context. This is not to deny that Li Hua’s image also speaks to a very specific audience (the Chinese nation on the eve of full-scale war with Japan), but to show the universal pictorial aesthetic the modern woodcut movement took as inspiration and carried even further. For woodcut artists, this meant returning to traditional folk art styles but changing the content to reflect new Socialist values. An ordinary peasant would immediately recognize and be able to “read” an image such as the typical door god woodcut such as the Lamp Lighting Daoist Door God. Following Mao’s theories laid out in his “Talks at Yan’an,” a woodcut artist such as Yan Han could masterfully retain the symbol of protection peasants used door gods for, but transform the door “god” from a Daoist immortal to a communist soldier in his New Year Door Guardian: A People’s Fighter—Cooperation between the Army and the People. This socialist realist legacy is related but distinctly different from the earlier realist aspirations of the Modern Woodcut Movement. What both aesthetic styles aspire to, however, is very similar: reaching a mass audience in an effort to mobilize them to effect social and political change. As an artistic medium, woodblock prints seem optimally designed for this aspiration—the medium lends itself to multiple prints for wider distribution and it does not require a high degree of literacy (as compared, say, to calligraphy for example). This may be partly why woodcuts are a favored medium for achieving a “universal pictorial language,” even if the color and texture of that picture changes from period to period in 20th century Chinese woodblock art.